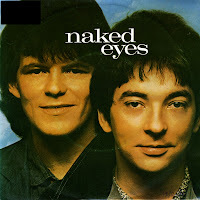 Back in 1984, while I was constantly watching television to see music videos, I got to know the duo Naked Eyes thanks to their video of '(What) In the name of love'. They were unknown in the Netherlands, but in the UK - where Music Box was based - they already had one hit under their belt with 'Always something there to remind me'. It took me years to find this single, but I finally did in 1995. What a relief! It was not a hit for Naked Eyes, even though the music video was a regular on television in the summer of 1984. Love this blog!! Been following for a little over a month and love the story behind your finds. Wanted to let you know that I have the promises, promises remix that contains the Madonna parts.